NAIROBI, Kenya, September 12, 2011 (ENS) – In one of Kenya’s deadliest tragedies, more than 100 slum dwellers scooping leaked oil from Nairobi storm drains were killed today when the fuel exploded into flames. 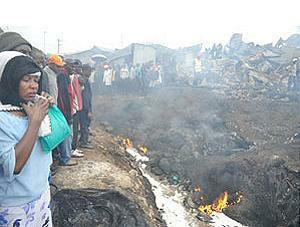 At least 160 others were seriously injured and were taken to Nairobi area hospitals. The oil came from a leak on the bypass line between the Mombasa-Nairobi and Nairobi-Eldoret pipelines, according to the state-owned Kenya Pipeline Company, which operates the pipelines. When the leak was detected, the company said, its engineers shut down the main Mombasa pipeline, which carries fuel from the coast to inland storage depots. Kenya Pipeline Company Managing Director Selest Kilinda told “The Nation” newspaper that stormwater from rain in the city this morning swept the leaked fuel through storm drains into the Ngong River, which runs through the Sinai slums in Nairobi’s industrial area. Sinai residents were gathering the fuel gushing from the storm drains when an explosion shortly after 9am blew off manhole covers, sending flames blasting out into the neighborhood. Witnesses said the fuel had collected near the wood-and-cardboard shanties, which quickly caught fire. Engineers poured foam on the blaze to prevent fire from backing up into the pipeline, but that did not save the residents of Sinai. Prime Minister Raila Odinga today visited Sinai to condole with families of the more than 100 people who perished. He also visited some of those injured at the Kenyatta National Hospital accompanied by his wife Ida. The hospital has issued urgent appeals for blood donations to save the lives of those admitted suffering burns from the fire. 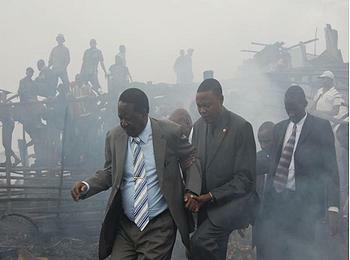 Prime Minister Raile Odinga visits the site of the fire, September 12, 2011. Observing that the accident was the worst to occur in the history of the country’s energy sector, Odinga wiped away tears as he termed the incident “tragic” and said it could have been avoided. “It’s unfair for people to die like this,” the prime minister said. Odinga said the government has begun an investigation to determine the cause of the leak and fire and avoid similar occurrences in future. Emerging from a briefing about the tragedy at the Kenya Pipeline offices, the prime minister said a possible cause of the fire was the failure of a gasket that caused the oil to leak into the storm drains. He asked the nation to “remain calm” and pledged that the government would compensate the families of those who lost their lives. President Mwai Kibaki sent a message of condolence to the families, relatives and friends of those who perished in a fire. The President also visited the injured admitted to Kenyatta National Hospital. Following the disaster, Energy Minister Kiraitu Murungi said his ministry was sorry and that thorough investigations would take place to determine the cause of the fire. The Red Cross has set up a tracing center at Family Hope Clinic at Sinai. Counseling centers have been set up at the City Stadium.